This classic Berenstain Bears story is a perfect way to teach children about the importance of giving and generosity! Come for a visit in Bear Country with this classic First Time Book® from Stan and Jan Berenstain. From closets and drawers to the attic and the basement - Papa, Mama, Brother, and Sister realize that they have too much stuff. But what will they do with it all? 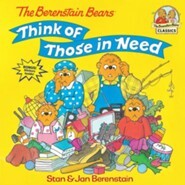 I'm the author/artist and I want to review The Berenstain Bears Think of Those in Need - eBook.